He stays some deportations even as he extends the draconian ‘secure communities’. Will the real president please stand up? How can President Obama continue to portray himself as the champion of immigration reform to Latino voters, while at the same time deporting more people than any other president in United States history? Two significant announcements this month offer a glimpse into an administration that appears to be playing both sides of a bitter debate over immigration reform. 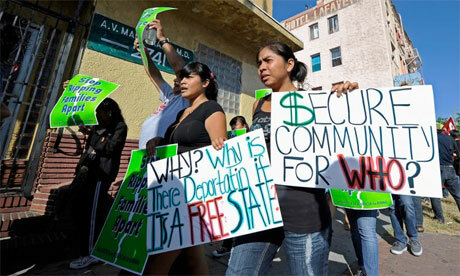 The first occurred on 5 August, when the Obama Administration announced that it would unilaterally impose its controversial deportation programme known as “secure communities” (also known as S-Comm) upon every city in the United States by 2013. The announcement stunned the immigrant justice community, which had spent the last year rallying against policies in Arizona that demonstrated to the world the dangers of using the local criminal justice system to engage in federal immigration law enforcement. S-Comm is a deportation programme that requires local police to run immigration background checks on every individual booked into custody, regardless of the charges and whether they are dropped or upheld. The effect is to make local police departments a primary gateway to deportation. Opposition to the programme reached new heights this summer with major newspaper editorial boards echoing the calls of local law enforcement, the nation’s largest metropolitan cities, congressional leaders and the governors of three states to shelve the programme. A recently published report from a broad coalition of immigrants’ rights groups bolstered concerns that the programme encourages racial profiling and hurts public safety, because immigrants are less likely to report crimes. The same month, on 18 August, the Obama Administration announced that it would review 300,000 pending deportation cases and temporarily stay the deportations of individuals deemed “low priority”, such as students, veterans, and individuals with strong community ties – provided they have no criminal convictions. While the announcement was a welcome respite for some individuals in deportation proceedings, and will undoubtedly keep some families together, it is not an “amnesty”, as the right claims. Most importantly, the announcement does not decrease the historic levels of deportations in the United States. Those two announcements this month show the administration’s duplicity on immigration. On one hand, President Obama continues to portray himself as a champion of immigration reform to Latino voters, while at the same time, his department of homeland security institutionalises policies that criminalise and divide immigrant (mostly Latino) families. Immigrant justice advocates and local communities have not been fooled. At hearings this month, members of a discredited “secure communities task force” – a committee created by the Department of Homeland Security supposedly to suggest improvements to S-Comm, but widely considered to be a political ploy to stem growing calls for the programme’s termination – were met with protests, walkouts, civil disobedience, calls for their resignation and chants to “end the programme”. In the final hearing, Maria Bolanos, a woman who was placed into deportation proceedings through S-Comm after calling the police for help, bravely confronted the director of the programme and implored him to think of his own children before expanding policies that separate families. The controversy around S-Comm has highlighted an indisputable truth: the struggle against the criminalisation of immigrants and the struggle for legalisation of the undocumented are one and the same. The Obama Administration seeks to make its unprecedented level of deportations palatable by dismissing those deported as criminals. The day labourers convicted of trespassing, the mother who returns to the United States after deportation to reunite with her family, the person of colour convicted of a minor traffic offence – all are labelled “criminal aliens”. The distorted use of this term, along with the expansion of immigration enforcement programmes like S-Comm, have driven the country further away from legalising the very people the president claims he’s fighting for. The president can win back his credibility as an advocate for immigrant rights and Latino families by ending the S-Comm programme, reversing the criminalisation of immigrants and putting us back on the road towards reform. This entry was posted in Press (United Kingdom) on August 29, 2011 by Ian.